A uniform civil code is 'neither necessary nor desirable' at this stage, the Law Commission said in a consultation paper on the last day of its term on Friday and suggested changes in laws relating to marriage, divorce, alimony, and marriageable age for men and women. Issuing a consultation paper instead of a full-fledged report on the contentious topic, the panel held freedom of religion as also to propagate it must be strongly protected in a secular democracy, but it is important to bear in mind that a number of 'social evils' such as the practice of triple talaq and child marriage should not be allowed to take refuge under 'religious customs'. 'To seek their protection under law as religion would be a grave folly,' it said in the paper titled 'Reform of Family Law'. A bill to ban the practice of instant triple talaq or 'talaq-e-biddat' is pending in Rajya Sabha despite having been passed in Lok Sabha. The panel, whose three-year term ended on Friday, said diversity of Indian culture should be celebrated, but specific groups, or weaker sections of the society must not be 'disprivileged in the process'. 'Resolution of this conflict does not mean abolition of difference. 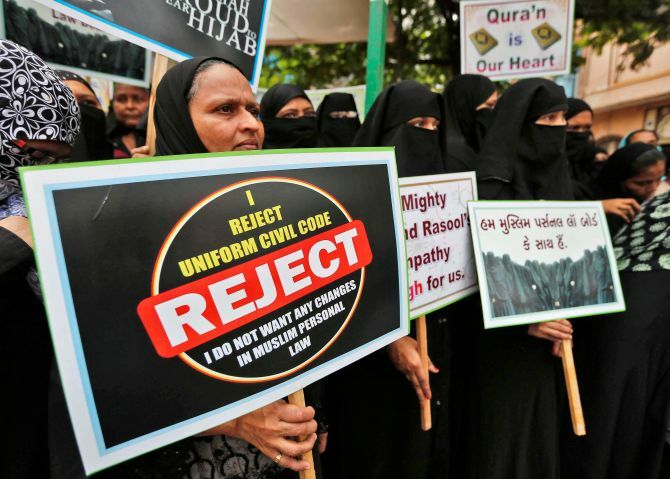 This Commission has therefore dealt with laws that are discriminatory rather than providing a uniform civil code which is neither necessary nor desirable at this stage,' the document said. The issue of uniform civil code is vast, 'and its potential repercussions, untested in India', it felt. "Therefore, after detailed research and a number of consultations held over the course of two years, the Commission is presenting its consultation paper on reform of family laws in India," it said. Panel chairman Justice B S Chauhan (retd) had earlier said instead of recommending a uniform code, the commission might suggest 'piecemeal' changes in personal laws. The Law Ministry had on June 17, 2016 asked the panel to 'examine matters in relation to uniform civil code'. However, it cautioned that at the same time, this principle does not automatically translate to an 'absolute' equal split of property at the end of the relationship, as in a number of cases such a yardstick may bring an 'unfair burden' to one of the parties. It said all personal and secular laws -- the Hindu Marriage Act, 1955, Special Marriage Act, 1954, the Parsi Marriage and Divorce Act, 1936 (for Christians), the Dissolution of Muslim Marriages Act, 1939 can be amended to reflect this change. The Special Marriage Act is described as a 'secular law' as inter-faith marriages are solemnised under it. The panel also said, "If a universal age for majority is recognised, and that grants all citizens the right to choose their governments, surely, they must then be also considered capable of choosing their spouses". Under the Hindu law, the paper discusses problems with provisions such as restitution of conjugal rights, and suggests the inclusion of concepts such as 'community of property' of a married couple, abolition of coparcenary and rights of illegitimate children. For Parsi law, there are suggestions relating to protecting married women's right to inherit property even if they marry outside their community. The paper also discusses lacunae within custody and guardianship laws, statutory or customary, and suggests the 'best interest of the child' has to remain paramount in deciding matters of custody regardless of any personal law in place. Although the sixth schedule provides for exemptions to north-eastern states and tribal areas, the panel suggests efforts of women's organisations in these areas be acknowledged to suggest ways in which family law reform could be aided even when direct intervention may not be possible. Since a number of issues such as polygamy, nikah halala, settlement of a Parsi wife's property for benefit of children, as well as the adultery law among others are under the consideration of the Supreme Court, they have been discussed in the paper but comprehensive changes on some of these issues have not been suggested.